Who was John Hosmer? To begin with I am not sure. A Lexington farmer, probably. I pick the name from among available parts because I recall that Hosmer's are associated with Concord. There is the Hosmer tavern in Sudbury along Route 20. Niece Abby attends the Hosmer public school in Watertown. This should be an easy part to research. I go to a book of Massachusetts genealogies. John Hosmer farmed along the old Stow Road near the Assabet River. He had sons, one of whom kept the farm and lived on it until 1843. But that is not a location in Lexington! An account of an early commemoration states John Hosmer was present at the 1835 sixty year celebration and re-interment of the fallen onto the Battle Green. Emerson wrote an epitaph referring to Hosmer's service during the Lexington Alarm and in the New York campaign culminating in Burgoyne's surrender. "Although in arms at the battle of Concord, and a soldier of the Continental Army, he was in all his life after a man of peace. Mary his wife died the 17th of June 1814, a prudent and faithful wife. She aided her husband and shared with him the love and veneration of 10 children." The inscription is on his grave stone in the burying ground near the center of Concord. This man lived into his eighties, a remarkable seniority in his time. Was this our own Lexington Minute Man who gathered in this Buckman tavern room the night of April 18th, 1775, and stood with the rest on the Green at dawn the next fateful day? Why is there no mention of this exploit? Could Emerson have confused the old Patriot's first fight in Lexington with action along Battle Road? If our John Hosmer spent the rest of his days among cousins in Concord, an epitaph deleting mention of Lexington service is plausible, given the town rivalries of those days. Just how many John Hosmers could there have been in small Middlesex County towns, much less two born in the same decade, soldiers both, who lived on into their upper eighties? I check available sources. None answer my questions. Lexington library has nothing helpful among surviving records. There are no tax assessments for any Hosmer in Lexington during the 18th century. My inquiry to the national archives for pension or other records finds nothing. My link and relation to John Hosmer leads no closer. I come to believe that Concord's veteran is not the Minute Man of Lexington, but I have no certain knowledge of Lexington's supposed Hosmer. I am left to reflect on the more general meaning of blood and heredity, the Minute Men, and what it means to be an American. It was one Sylvanus Wood who heard the tolling in Lexington of the Old Belfry and made haste to Lexington where he stood among our militia. This was not the call of related kinfolk but of people holding common principles. It was so in their time and it is so today. Mr. Wood was not one of us, but was welcomed just the same in common purpose. Here at Buckman tavern, in this very room where we suppose that our aged and mysterious John Hosmer gathered in 1835 with the remaining veterans, sharing recollections of their tumultuous youth. We stand in place of those Minute Men of history. 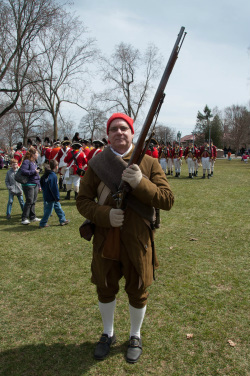 Some among us proudly trace their ancestry to the Lexingtonians of that April time 226 years ago. But of myself and others in the Company, we do not all come of Brahmin stock to join Liberty's call, but from places and ancestries further distant: Italy, Ireland, Poland, Russia, Asia, Africa, etc. - Jews, Catholics, slaves in shackles. The common call of government accountable to the people, government by laws and orderly process, and individual success related to the fruits of one's work and contributions - this all makes for the common thread tying disparate people into one. Whether one's forbears joined Lexingtonians from Bedford, or from other countries in subsequent generations, does not ultimately matter. What makes an American is not birth, but ascription to a set of precepts and ideals. Indeed, as much as Old Lexington men and women cherished families, when forced to choose between what they saw as their rights as a free people and the ultimate hereditary privilege embodied in the kingship, they chose an uncharted new course and asserted it through a protracted and bloody conflict. Who is John Hosmer? The details are difficult for me to discover. Perhaps he is a farmer otherwise undistinguished in subsequent life from those around him. I know we claim him as one of Lexington's own. His Concord namesake has 10 children. Emerson bestowed words of honor on the Concord veteran; ours never had sugared words. It is even possible, given the eccentricities of history and memory, that the Concord and Lexington John Hosmers are one. Before giving up entirely, I pursue one last lead. The National Archives, in their earlier rejection, mention that they have a Hosmer who was granted a Revolutionary War pension while living in Bedford during the 1830s, and who later died in 1839 in New Ipswich, Hampshire. I visit the Bedford town library and search its archives. Here the facts emerge. There is another John Hosmer. He is a Revolutionary War veteran. He has little to do with the Hosmers of Concord. Written out in longhand by a genealogist working years ago: John Hosmer, born 1758 in Medford. Married in 1781 to Anna Fosgate of Bolton. Moved to Bedford before 1790, and is listed as having lived in Lexington, among other towns. He experiences modest success as a shoemaker around 1800, but loses a partnership making children's footwear to industrialization and the emerging shoe mills. By the 1820's the town of Bedford is paying for John's upkeep and he is in debtor's prison for a time in 1826. Our John Hosmer has 8 children with his Anna, born between 1782 and 1798. I look in an old book on Bedford town history, published in the 1890's. Here is the answer to my quest. "Removed to Lexington, where he was a member of Captain Parker's Company at the Battle of Lexington." He is here, at age 17! He was born elsewhere and moved from Lexington as a young man. No wonder there is no trace in our archives. Other tantalizing details emerge. It is said that he is educated in preparation for Harvard College. "At the death of his benefactress, Madame Ryall, he becomes a shoemaker." Who is Ms. Ryall? How does she become a benefactress? Was Hosmer an orphan or abandoned as a child? What is it to be a 'benefactress' in 18th century Massachusetts? Why does his large family abandon him in his old age? So many unanswered questions. I hasten to mail another request to the National Archives, this time directing them to our John Hosmer. I receive a photocopy of the pension documents, wherein this account is recorded, "On the morning of the 19th of April, 1775, he was one of the Lexington Company of Militia, formed up on the Common, when the British advanced and fired upon them." The narrative goes on to describe participation in Battle Road skirmishes in Concord, actions harassing the British all the way back to Boston, and the Siege of Boston in its early weeks. In subsequent service as a Continental, he fights at White Plains in 1776, and Ticonderoga and Stillwater in 1777. So, I can now say with certainty that John Hosmer was a citizen who exceeded his obligations during a troubled period in history. He did service on the Town Green that April morning, at the Siege of Boston and as a Continental enlistee. We can only speculate what he thought and believed, not only as a teenage militiaman, but in the sunset of his life as one of the handful of survivors present that re-enactment day in 1835. Even without knowing the personal details of a common man almost lost to history, and with no descendants to trumpet and amplify his deeds, I can say that I represent someone who stood for precepts that make our nation great, that jelled in a volley of musket fire that April morning, events he in some small way helped to shape. I know what I will call out this year in answer to Captain Parker's roll-call on the Green. With a mixture of pride, awe and humbleness I will shout, "I am John Hosmer."